Making Strange: Oh No You Dint Pepsi! 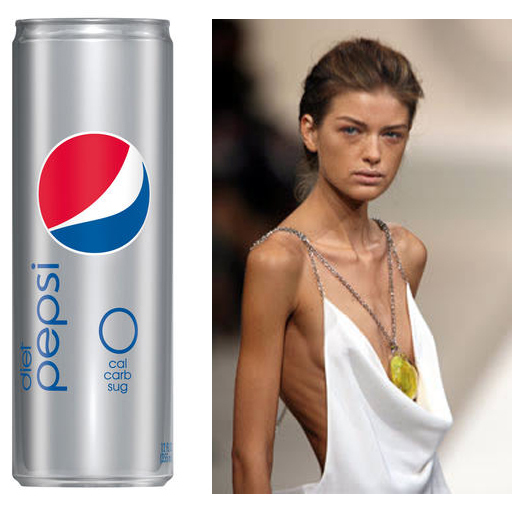 Can we chat about the new Pepsi 'skinny' can that was just launched as part of New York Fashion week? In the past few years Pepsi has been trying to differentiate itself from Coke (who we all know is eeevil) by doing nice things like the Pepsi Refresh Project. Yeah okay, like when McDonald's is the official sponsor of the Olympic games there is something a little bit disingenuous about this, but even so the effort has seen millions of dollars go into the hands of people working at community level to make a difference in their cities and towns. Big companies are almost always going to have a public image, publicity-driven motive for doing these kinds of things, but that's generally something most consumers are willing to overlook if the results are good. I would like to see more realistic looking body types (male and female) in the fashion and entertainment industry so the rest of us aren't continually bombarded by the ridiculous notion that our ability to disappear when turning sideways is more important than our health. I would like healthy, fresh food to be as readily available and affordable to low income communities as sugar and chemical laden convenience options that have become the cornerstone of the Western diet. I would like the FDA to actually ban products like Aspartame that have been demonstrated to cause brain tumors in rats and were only approved for human consumption in the first place because of shady back room deals. I would like you to fire the horribly confused executive who thought to create the 'Skinny Can' and launch it during a cornerstone event for an industry in which women regularly starve themselves (many have died) to fit this odd ideal that is meant to make us want to buy clothes (and drink zero calorie drinks apparently). I would like you to revisit the content strategy that made you think it was okay to use terms like 'Get the Skinny' and the assertion that this idiotic PR stunt has anything to do with the "celebration of beautiful, confident women." 'Get the skinny' is so cliche that it hurts, never mind the hypocrisy and falseness of the message. I can only imagine how much money Pepsi spends on marketing and on employing clever people to build their brand. And I wonder, who their target audience is for this campaign? What mass demographic of your consumers are you trying to speak to with this? Is Pepsi getting attention for this? Yes. Is it the kind of attention that will endear them to their consumers or help to move their brand forward - further differentiating them from the Coke monster? No. What the eff Pepsi? This campaign is like bad plastic surgery. It just makes you look ... weird. Image Credits: Pepsi Can from Grist, Skeletor Model from Hanistan, Donatella Versace from Pictures Chat.